Icy Dock announced the MB982 Metal Series, a line of adapters that convert 2.5" HDDs and SSDs to the 3.5" form factor. Icy Dock has been the leader of quality made 2.5" to 3.5" SATA SSD & HDD Converter. We offer a line of converters that feature a full metal construction to hold up to any application. With a full metal converter you never have to worry about your SSD or HDD being damaged. Our full metal converters feature: Airflow Vents for Heat Dissipation with Anti-vibration Design, Universal Mounting Holes for Most Common PC Cases, Screw-less Design for Quick & Easy, Compatible with 15mm height drives. 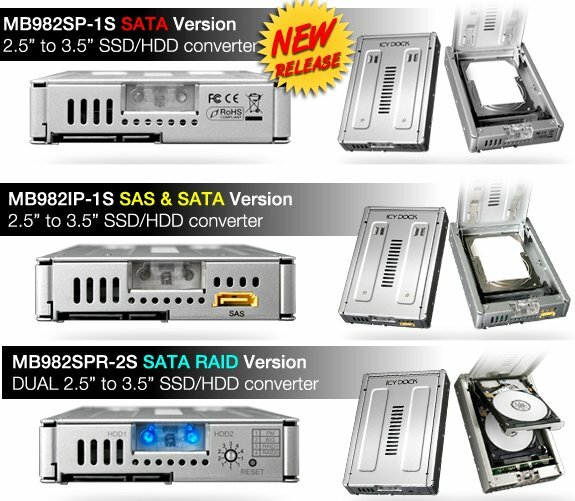 The MB982SPR-2S is a unique converter with built in RAID, featuring RAID 0, RAID 1, BIG, and Port Multiplier. Our converters can be used where ever a 3.5" drive can be used. Since our converters have the same form factor as a standard 3.5" drive, you can use them in a hot-swap bay, Mac Pro, Server, Backplane, or any application a 3.5" drive would go. If you are a Mac Pro user our converters are perfect for upgrading your system to a SSD. Being full metal the drive will be fully protected, great for industrial use where protection is a must. Our converter line is excellent for System Integrators and IT Professionals that strive to use the best products. * Converts a 2.5" SATA Hard drive / SSD to a 3.5" SATA hard drive. * Full Metal and Heavy Duty with Easy Access to Drives. * Converts a 2.5" SAS & SATA hard drive / SSD to a 3.5" SAS / SATA hard drive. * Screw-less and Tool-less Design Saves Tons of Time For Installation and Maintenance. * Built in RAID featuring RAID 0, RAID 1, BIG, and Port Multiplier. * Blue Status LEDs on Release Latch. * Windows and Mac Software for RAID Set Up.